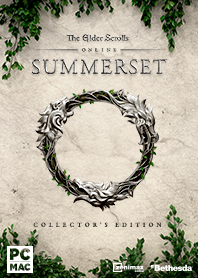 The Collector's Edition of The Elder Scrolls Online: Summerset includes additional exclusive content. A map of Summerset Isle. A copy of Razum-dar's Journal. A Bloodshadow Wraith Steed mount. A Fledgling Gryphon vanity pet. The Divine Prosecution outfit style. The Psijic Scrying Talisman memento. The House of Reveries emote pack. The Queen's Bounty Pack and the Nightmare Senche Mount, which were otherwise only available by pre-ordering. The Collector's Edition was available from retail, and is now only available through the PC/Mac Store, Steam, the PlayStation Store, and the Xbox Store. Those with pre-existing accounts can receive the digital content by purchasing the Digital Collector's Edition Upgrade, available from the PC/Mac Store, Steam, the PlayStation Store, and the Xbox Store. This page was last modified on 24 February 2019, at 01:43.